For a FREE consultation, call 800-490-3350. Find our how we can work with your business to achieve the best ROI. Check out our video about online marketing and ROI. Do you have ROI questions? Contact us today. 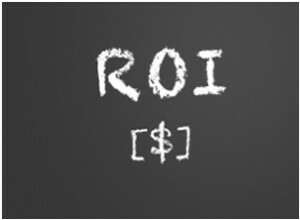 When you talk about ROI, it can mean a lot of different things with online marketing. Some people talk about search engine rankings (not a very good measure of success). Some people point to click through rates with paid search (an indication but not a great metric). Others refer to open rates with e-mail marketing or views of a video. At the end of the day, data isn’t about leads or sales. We need data to do our job and measure some trends. But all of our efforts should meet business goals that often are rooted in leads and sales. Yes, some companies use online marketing for brand awareness, recruiting, etc. Generally, we’re talking about connecting with prospects and getting them to sign on – whether the buying cycle is immediate or 6 months. We take the time to learn what’s worked for clients in the past and what hasn’t. If we’re going to help you with ROI, we need to know what success we can top. Sometimes companies haven’t been keeping track of their ROI. We get it. We’ll help you move in a new direction if that’s the case with your business. If you want to generate a positive ROI with online marketing, you need to know your business. It's that simple. Online marketing for small business requires some legwork on your work and cooperation with a search engine placement specialist. If you give a marketing consultant $1,000 a month, he isn't going to get you $5,000 back the next month. It might be possible with paid search, but some online marketing efforts are long term, like SEO. It's best to cooperate with the consultant who may need assistance like content writing. You know your business the best - so you should be drafting articles or editing what the consultant writes. Be weary of a consultant who wants to get you links without accountability. You may never see a positive ROI if your consultant is only getting easy links by establishing new profiles on forums. Take the time to ensure that you're getting links that can influence search engines and drive traffic as well. In the end, if you give a consultant $20,000 in a year, you should expect to get a good return - whether that's triple your investment, five times what you paid, etc.